If you want to stretch your legs even further, the Naha River trail system (a 20-minute boat ride from the lodge) boasts a 9-mile Forest Service trail that will have you forgetting all about the stress you left back home as you wander through thousands of years worth of growth, viewing the flora and fauna of the temperate rainforest, as well as keeping your eyes peeled for local wildlife. If you’re looking for an exciting day excursion, plan a trip to Ketchikan where you can take in the local shops, sightseeing opportunities, or join one of many available organized tours. 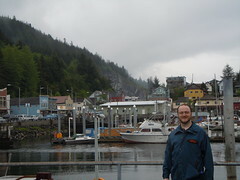 No matter what your interests are, there is sure to be something exciting for you in Ketchikan.